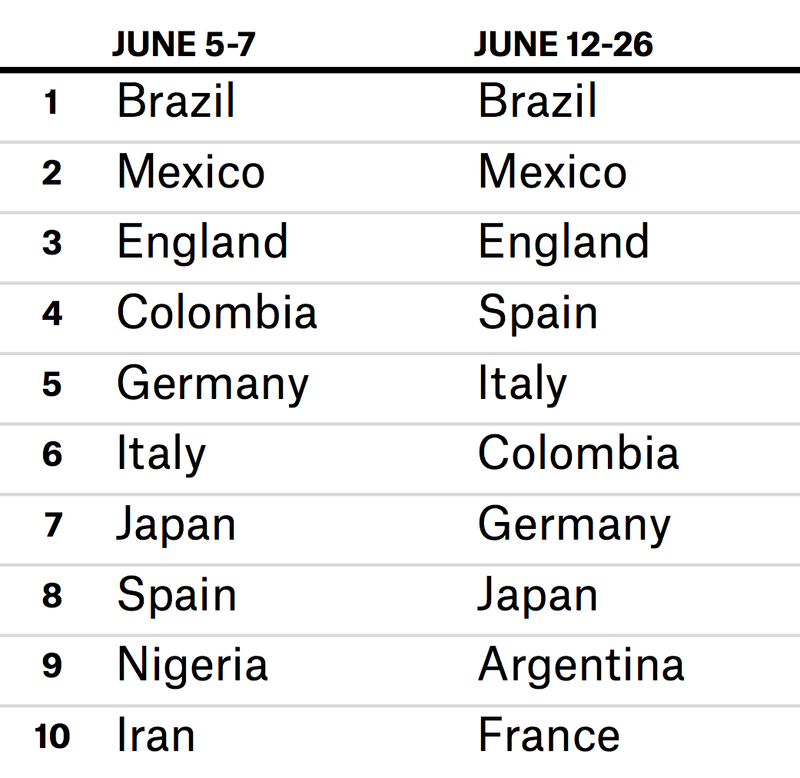 With the U.S. Out, Which World Cup Team Will Americans Root For? U.S. soccer fan Brandon Wong is tossed in the air by friends watching the 2014 World Cup soccer match between the United States and Germany at a public viewing party in Detroit. Following the United States’ brutal 2-1 extra-time loss to Belgium on Tuesday — despite an amazing performance by goalkeeper Tim Howard — fans in the U.S. are without a rooting interest in the World Cup. Casual soccer fans who supported the U.S. men’s national team may tune out now that it’s out, but many Americans will continue to watch. Which team will they cheer for? Probably one of two favorites: Brazil and Germany. FiveThirtyEight conducted a SurveyMonkey Audience poll of nearly 1,100 U.S. residents and asked them which country they were rooting for. The poll was conducted June 23 and 24, toward the end of the group stage. After recording the respondents’ first-choice country, the survey asked which country they would root for if their top choice were eliminated. This gave us a good proxy for U.S. fans’ backup teams. No one country had a dominant share of U.S. fans’ support. England came out on top with 16 percent, but the Three Lions flamed out of the Cup early on. England was followed by Brazil, Germany, Italy and Mexico. Of those countries, only Brazil and Germany remain in the tournament. Not every survey respondent chose a backup country. Of those who chose the U.S. as their first choice, about 5 percent then picked either the U.S. (again) or refused to pick any country (labeled as “none”). What about those 26 percent of respondents who did not select the U.S. as their first-choice? The most-backed countries after the U.S. were Brazil (17 percent), Germany (11 percent), England (10 percent) and Mexico (7 percent). But this method of figuring out whom disappointed U.S. fans will now support is highly imperfect. The poll, conducted online, is likely to under-weight fans without reliable Internet access, as well as fans who don’t speak English. That second flaw is especially problematic, because it probably means many fans with origins in Central and South America are excluded. 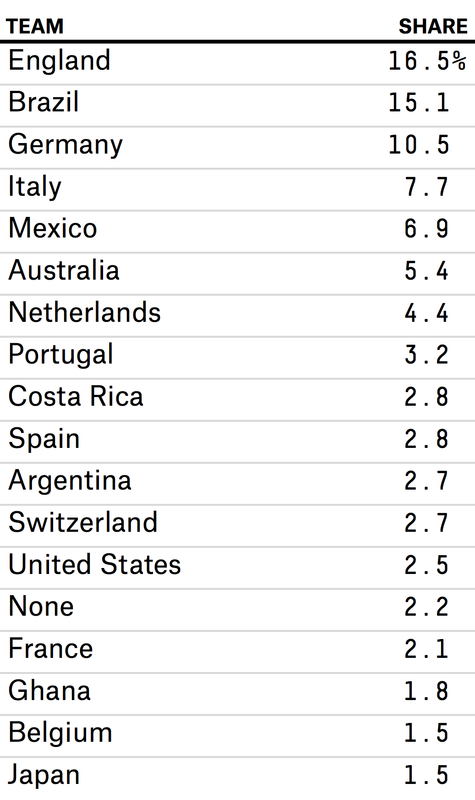 So, is England really the second-most-supported team among soccer fans living in the U.S.? I’m skeptical. I suspect Mexico is a better bet, with nearly 12 million individuals born in Mexico living in the U.S. as of 2011, according to the Organization for Economic Cooperation and Development’s International Migration Database. To augment our admittedly incomplete survey, we reached out to Google to find data on the top countries searched for in the U.S. Specifically, the searches tallied are for country names combined with the phrase “World Cup.” Obviously, merely searching for a country on Google isn’t the same as rooting for that country. But it’s an approximation of interest. The Google Trends team nicely summarized the most-searched-for countries on a couple of days prior to the World Cup (the tournament began June 12), as well as during the first two weeks of the tournament. Brazil was the top country queried, although this is probably confounded by its host-country status. Those using Google to search for “Brazil World Cup” could either be interested in the tournament as a whole or in the Brazilian national team. It’s not clear. Mexico and England were the next most-sought-after countries. Mexico does better according to Google than it did in the poll, lending some credence to the idea that the English-only survey underestimates support for El Tri. But even the Google data may underestimate support for Latin American teams. The Google queries here are only for searches in English. Spain and Italy were more searched for in the first couple of weeks of the tournament, and that probably has a lot to do with them being eliminated earlier than expected. In addition to Brazil and Germany, the other highly searched country that remains in the tournament is Colombia. So, with the U.S. men out, expect a sizable number of soccer fans to be supporting Brazil and Germany through the rest of the tournament.